a fully rotating tower, powered by the sun. “We didn’t want to build just another building or tower,” said Tav Singh, director of Dubai Property Ring, the Dubai arm of UK-based property investors UK Property Group. This thing is also a timepiece! “A distinctive time line runs down the building that meets 12 o’clock markings on the ground and the podium, allowing observers to use the building as a fully functioning time piece” said James Abbott, senior architect at Palmer and Turner. 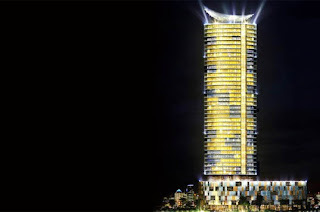 The tower was designed by UK architecture firm, Glenn Howells Architects (the company behind the Birmingham Rotunda in the UK) and Palmer and Turner, the master developers of City of Arabia. The task of rotating an 80,000 tonne tower through 360 degrees over a seven day period has been handed to Nick Cooper, managing director of Bennett Associates, the British engineer who designed the drill machine that bored the English Channel Tunnel. Cooper said state of the art bearing systems at several points in the tower will allow a power plant to rotate the base of the tower at 5mm per second using only 21 electic kettles’ worth of solar power. Construction is scheduled to start in June and to finish in 2009. And expect one near you soon. Singh said the company plans to build 23 more rotating towers in each of the world’s time zones.